The heat pumps may not be a perfect solution for every home and so it is vital that you get the right advice from a reliable and trustworthy heat pump specialist. Also known as air to air heat pumps, air source heat pumps are semi-renewable systems because they extract the heat from the sun which is contained within the outside air. Air source heat pumps work by taking the heat from the air and boosting it to a higher temperature and using the hot air to heat water for central heating or underfloor heating system. Air-to-water heat pumps – they heat water which is then pumped around the radiators in your home central system. The lower temperature of the water will also suit an underfloor heating system. Air-to-air heat pumps – the heat extracted from the outside air is used to heat air which is then pumped around the house in ducting. This type of heat pump cannot be used to heat water. The air-to-water heat pump is the most popular type of heat pumps because of its ability to heat water. round source heat pumps are another technology which rivals air source heating pumps but it is more expensive. Installing an air source heat pump will cost between £7,000 and £11,000. The installation price will differ regionally across the UK, as well as depending on the system you choose and the size of your home. Save between £350 and £560 per year if replacing an oil heating system. Save nearly £1,900 per year if replacing an LPG fired heating system. Save between £700 and £1,300 if replacing an electric night storage heating system. Is your home suitable for heat pump installation? If your home is off the mains grid and you rely on electricity, LPG, oil or solid fuels (which are more expensive than gas), you will gain more from installing an air source heat pump. e which retains heat well will benefit more from air source generated heat because the temperature is lower (think loft and cavity wall insulation). Are you planning on installing an underfloor heating system (or have one installed already)? Then air source heat pumps can generate the heat you need. As a rule of thumb, before considering installing an air source heat pump, you should make your home as energy efficient as possible by insulating and sealing all gaps. These measures will reduce your home’s heating needs to a level that will suit an air source heat pump. Reduce the amount of electricity you use thereby reducing the CO2 you generate. 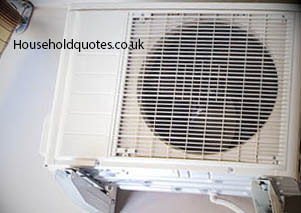 Air source heat pumps require little maintenance after installation. They perform a dual role, heating in winter and can provide cooling in winter. More efficient use of electricity that storage heaters. Grants may be available to pay towards installation costs. If you are switching from a gas central heating system you may not realise any savings, unless you are replacing a very aged system. You will require space outside your home to install the heat pump so it may not be suitable for every property. The operating temperatures you can achieve are lower than with gas or electrical heating systems and so you will have to make adjustments. Unlike other heating technologies, air source heat pump require a level of expertise different to the traditional heating systems. A poorly installed heat pump will not heat your home properly and you may take a very long time to recover your investment in energy savings. It is up to you to ensure the installer you appoint is experienced and have a verifiable work history installing heat pumps.